Adventurous Feet: Win Roundtrip Domestic Ticket from AirAsia Zest: The Right Way To Fly! 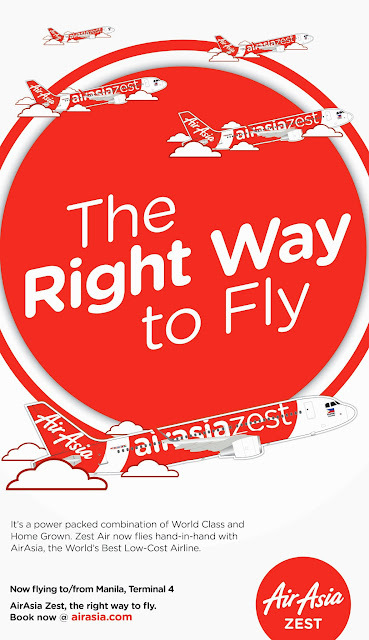 Win Roundtrip Domestic Ticket from AirAsia Zest: The Right Way To Fly! 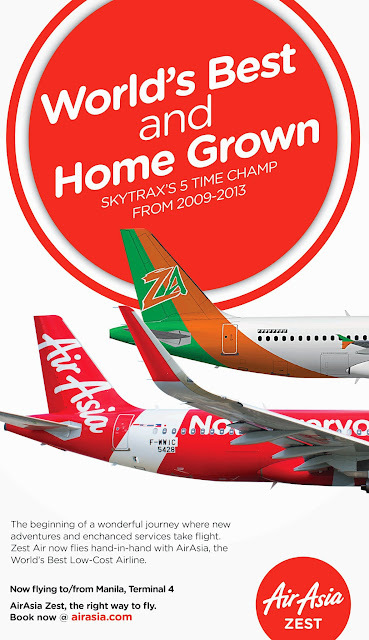 AIRASIA ZEST’S GREAT NEWS TO TRAVELERS! Tagged as being the World's Lowest Carrier Airline, AirAsia Philippines is now in alliance with Zest Air! The Civil Aeronautics Board CAB approved “AirAsia Zest” as the new brand name of Zest Airways, Inc., as well as the incorporation of Air Asia’s signature logo. I recently attended NuffnangPH's event to extend this news to bloggers and as a travel enthusiast, it's an interesting development we should all look out. The airline is currently updating its records with the Civil Aviation Authority of the Philippines (CAAP) to include the new business name “AirAsia Zest” in its permits with CAAP. Indeed it is a great news as the combined strength of the two shall offer travelers more choices, better value, and enhanced services across their domestic and international routes. If you can recall, AirAsia used to fly from Clark. The good news is that, AirAsia Philippines is now in Manila! Flying to/from Manila is an advantage to many travelers. Two thumbs up to AirAsia for the effort to improve their routes. Some of the people I know was hesitant to book, but now, there's no reason to think twice! AirAsia Zest now flying in Manila! Now that ZestAir has been rebranded as AirAsia Zest to reflect its partnership with AirAsia, here are the list of flights of AirAsia Zest in Manila. Miri, Malaysia, Macau and Cebu! In line with this big change, AirAsia Zest has added few more routes! Yipee! Miri is the second largest city in the Malaysian state of Sarawak on Borneo. The discovery of oil 100 years ago transformed Miri from a quiet fishing village into a wealthy city. It has four National Parks each offering distinct attractions: GunungMuluis a UNESCO World Heritage Site and famous for its caves and limestone formations; Niah was the discovery site of prehistoric human remains; Lambir Hills has stunning waterfalls and wildlife; and LoaganBunut is ideal for hiking and birdwatching. Macau is a special administrative region of the People's Republic of China, located across the Pearl River Delta from Hong Kong. The tourism draw is based largely on gambling, with numerous casinos and hotel casinos. Macau, a former Portuguese colony, offers a rich blend of Chinese and European architecture and culture. A large section of Macau Peninsula has been designated a Unesco World Heritage site. 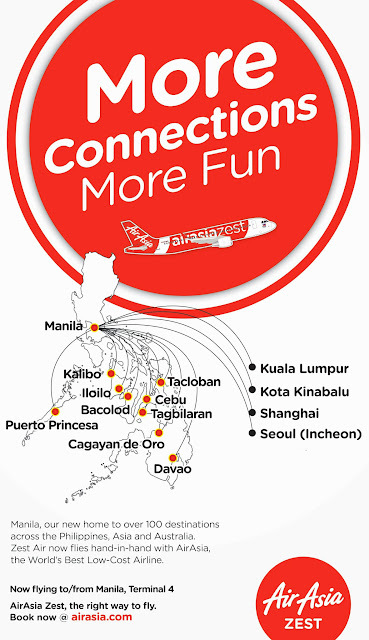 Aside from this rebranding, Air Asia Zest continues to expand its network adding four new direct flights from Mactan Cebu International Airport to Kuala Lumpur LCCT Airport, adding to four tourist destinations namely Puerto Princesa (Palawan), Davao and Cagayan de Oro in the Philippines. Puerto Princesa is a home to many beautiful islands and the famous Underground River. Also, one can take a bus to El Nido, another amazing beauty in Palawan. Davao, on the other hand, is such a lovely city and your gateway to exploring Samal island. Cagayan De Oro is famous for white water rafting (it is a must!) and different adventures and natural wonders which is reflected up to its nearby province of Bukidnon and Iligan City. AirAsia Zest also mentioned spectacular seat sales in the upcoming weeks. Follow their Facebook page and watch out! The event was held in New Orleans in Bonifacio High Street, Taguig City. I wanted to thank New Orleans and Claw Daddy's for an awesome dining experience. New Orlean's Bourbon Street steaks, oysters and ribs and Clawdaddy Great American Picnic, and enjoy their best ribs, crabs and boiling bags. Visit New Orleans and Clawdaddy to experience a clawsome dining and celebrate #Thanksgiving dinner buffet on Nov. 28 and 29 in town. Win One Roundtrip Ticket For Free! Air Asia Zest is giving away one roundtrip ticket to any domestic destination. 5. Tweet "Win 1 Roundtrip Ticket To Any Domestic Destination c/o @AirAsiaPH & @AdventurousFeet read here: http://goo.gl/pB1tJD #AirAsiaZest"
6. Post on your facebook wall (must be in public setting) and tag Adventurous Feet and Air Asia's Facebook account: "Adventurous Feet and Air Asia Philippines is giving away one roundtrip domestic ticket. To join, read here: http://goo.gl/pB1tJD"
7. Post a comment with your answer to this question: What domestic destination will you choose? Kindly use the Rafflecopter below to join. Terminal fee is not included in the ticket. Filipino residents aged 18 years old and above only. Whoahahaw..looking forward for direct trip to Masbate. Thank you Air Asia Zest. I would like to go to Kalibo. I want to go to see Cebu the Queen City of the South to see the beauty of their place and its history. What domestic destination will you choose?